While our stay was short in Arches National Park, it was well worth the stop. If you want to see most of the park, you can easily do it 5 hours. We did most of it in 4, but we felt rushed. While we could see spending a night camping there, we choose to kind of blaze through the park do to time constraints (we drove through to Bryce the same day, as we wanted to camp there). In terms of getting around, early morning is best, as there is only one road that dead ends that leads you around the entire park. I say early morning, and I will say this again for every single park, because quite frankly, people are lazy, and if you can get up early, even around 8am, you will have the park to yourself. After that, the parks do tend to get crowded, and particularly at Arches, the small parking lots will leave you waiting for a spot, which can be frustrating. However, if you need to go through like we did, from 10am-2pm, it is definitely doable and worth it. We did a couple of really short hikes on our visit to Arches. While we didn't hike the Park Avenue Trail (1 Mile One-Way, as you get picked up on the other side), we did stop to gaze as it goes along this beautiful canyon of sorts. Pictures below. Our next stop in our drive around the park was at Double Arch, which was my favorite part of the park. The trail there is .25 miles each way, easy, about 5 minutes from the parking lot and it rewards you with a spectacular double arch rock formation.This is about a 30 minute stop just because you can go walk through/hike into the arches. Wikipedia Link. After Double Arch, we head across the way (really the parking lot) to an area known as the Windows, which contains the Windows Primitive Loop Trail (1 Mile Loop). Here you can see North and South Windows (arches) and Turret Arch from a very flat and easy trail. The guide books say the trail is primitive because there is a second part of the trail that goes around the back of the Windows that is "primitive", i.e. it is not a flat, trampled to dust trail. In other words, you will want to take this trail. It gets you out of the way of 90% of the tourists and is still an extremely easy and flat trail, it just isn't as clearly marked. Here is a panorama from the back of the Windows. You should allow from 30 minutes to 1 hour if you want to take your time and also the back trail, if not, you can breeze through this part in 15 minutes. Our second to last stop at Arches was a lookout for Delicate Arch. This is the arch that you always see gracing the covers of Utah tour books and AAA maps. We were actually moderately underwhelmed by this arch compared to the others just because we were so far away. After seeing it from the lookout point (.25 mile, 15 minutes, slightly hilly), we would recommend taking the extra 2 hours to go and hike up to it if you can to get a closer look. Also, we could imagine it being even prettier in the early morning light. So if we were to go back, we would go around 5am or 6am, one to avoid the crowds and two to see it in the morning light. However, note that the full trail to the arch is 1.5 miles each way and is listed as moderately strenuous. Our last, and slightly rushed stop, was Landscape Arch, which the guide said was the one must see stop in the park. It did not disappoint. 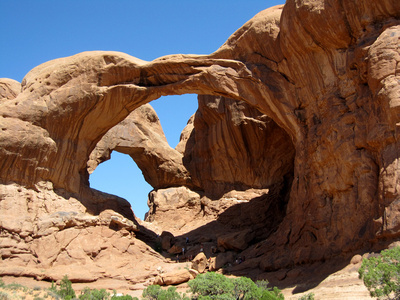 Landscape Arch is considered geologically mature and may fall at a point in the near future, and just by looking at the picture, you can tell it is going to fall down quite soon. This is a 2 mile round-trip hike over very flat dusty paths, considered easy. Parking can be impossible for this in mid-day, as we discovered, because of the many picnics people were having at the time. We found that you can really park anywhere you see a spot. It is hard to explain, but you will understand once you see it. Overall Verdict - Arches is a beautiful park that definitely deserves a spot on your road trip. Days/Nights to Camp/Spend Here - I would not recommend camping at Arches if you are a serious hiker, as there are not that many long hikes to complete. However, if you arrive around 3 pm and use it as a stop over to see the park and drive on the next day, that would work. Camping Evaluation - Didn't camp, so your guess is as good as ours. Best Time To See Arches - I would guess morning, before 10am. The light is the nicest for photography, there will be no people out, as we found at other parks, and there will be no traffic. The early bird gets the arch. Tips/Tricks - You can do Arches in 5 hours or less. Also, take the Windows Primitive Trail if you go see the Windows, it will get you away from the crowds. Best Hikes - If you have time, do the full hike out to Delicate Arch. Otherwise the viewpoint is sufficient along with Landscape Arch. Don't miss Double Arch. The Windows are pretty, but if you are short on time, you can miss them.